There are 4 main reasons for partitioning a switchboard. To protect persons against direct contact with dangerous parts. The minimum degree of protection must be IPXXB. To protect the switchboard against the penetration of solid foreign bodies. The minimum degree of protection must be IP2X. To facilitate maintenance operations or switchboard upgrades. 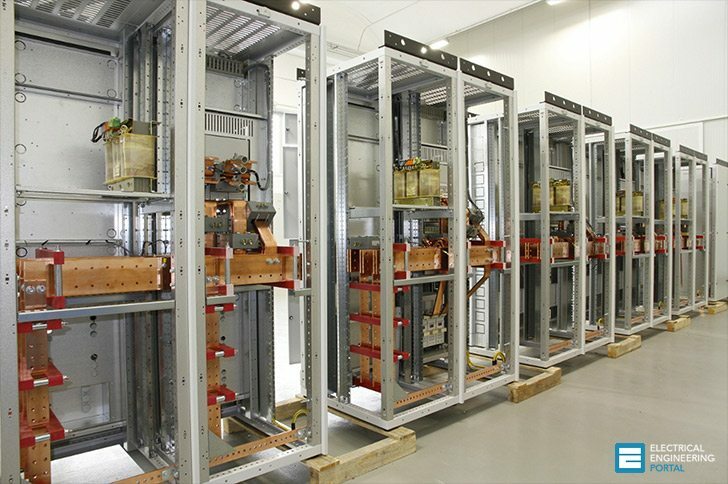 Partitioning rules are defined in standard IEC 61439-2. The definition of partitioning depends on conditions of use, maintenance and upgrade of the switchboard. This definition is subject to agreement between the switchboard manufacturer and the end user. Conduct clearance, bonding continuity with a final inspection recorded in a contract document. Full compliance with these recommendations can be validated by a compliance certificate. The standard defines 4 partitioning levels (forms) to ensure the protection of persons against direct contact. The form is a solution provided to an IP protection requirement and a client need (Operation, Maintenance, Upgrade). No separation inside the switchboard. The covering of the upstream and downstream pads of the incoming device, to ensure the operator’s safety at all points of the switchboard when the device is open. Protection against ingress of solid foreign bodies. There are two variants of form 2: Form 2b provides more safety than form 2a, since the connection terminals are separated from the busbars. 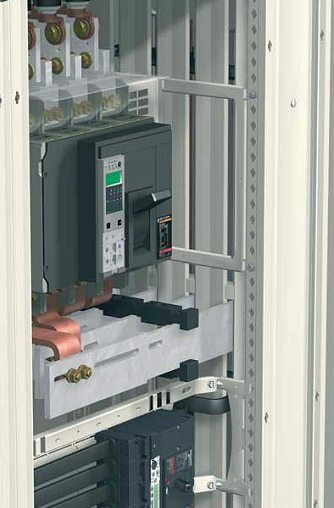 Terminals for external conductors are not separated from the busbars. Terminals for external conductors are separated from the busbars. Limitation of the risk of faults between each of the functional units (propagation of electric arcs). There are two variants of form 3: Form 3b provides more safety than form 3a, since the connection terminals are separated from the busbars. There are two variants of form 4: To fit the cubicle with gland plates to create form 4a or to cover the connection pad of outgoing devices to create a form 4b. Terminals for external conductors are in the same cubicle as the functional unit with which they are associated. Terminals for external conductors are not in the same cubicle as the functional unit with which they are associated, but in protected spaces or individual compartments that are separated and closed. By using devices with molded cases. The entire switchboard must have a degree of protection of IP2X in accordance with IEC 61439-1 and 2. If using metal barriers, make sure that clearances are complied with. Putting partitions in a switchboard reduces heat dissipation of the switchboard. It is therefore important to take this into account when defining the heat management solution for the switchboard. For example form 4 switchboard dissipates less heat than a form 1 un-partitioned switchboard. Barriers must be robust enough to ensure that a possible mechanical stress on these components (reduction in clearance distance, or even accidental contact with live parts) does not cause an accident. If a busbar is installed at the bottom of the switchboard, you must use a form 2 to protect it from the possible drop of a metal object. Remember to stick a warning label (“do not walk” and “electrical hazard” symbol) on the top of the form. Need the form type document. what’s different between Form 4B type 5 vs Form 4B type 6? The diagrams shown in this document are very clear. A good reference document. Do not under-estimate the power of a Common Voltage. Most fires and accidents do take place at 415/230 V level. More details regarding type of partition to cater to Prevention of Arc Propagation and the standards for the same are needed. Now I don’t have anything to do with switchgear manufacturing. I am an end user. (specifier) But I think this proceedure is ‘over the top’. In other words, is it really necessary? What are the statistics of accidents caused by not having these ‘partitions’? Overheating seems more threatening than the possibilities of an accident. Anyone working on LV switchgear is, or should be a trained mechanic. This appears to again, raise the cost of LV switchgear and place a burden on the specifier to comply with silly rules. It smacks of the same uninformed decisions made by politicians to reduce gun violence. Just saying …. Every additional partitioning makes maintenance and operating safer and faster. Imagine you want to replace one feeder cable but to draw it out you have to switch off the whole busbar because the individual feeders are not partitioned….rings a bell? Every additional safety precaution adds value, always.